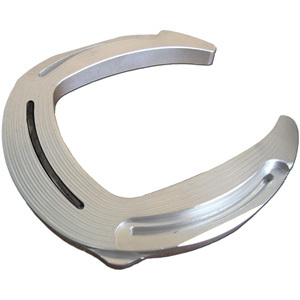 All NANRIC aluminum shoes are creased but not punched as the position and pitch of the nail hole is best left up to the farrier's discretion. The Full Rocker, or “banana shoe,” is available in sizes 1, 2, 3, and 4. Most horses have a club foot which is smaller and a "slam dunk" foot that is larger. The CC denotes C for Club and C for the amount of radius/belly the shoe has. Each shoe has a steel insert added to help slow the wearing process and give added protection.